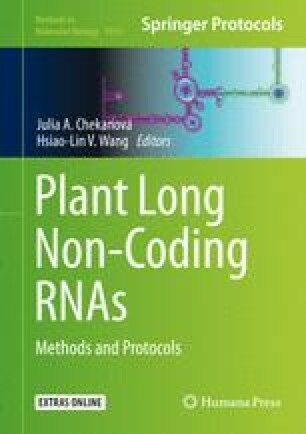 Recent advances in next-generation sequencing have revealed that majority of the plant genome is transcribed into long noncoding RNA (lncRNA). Many lncRNAs function by interacting with proteins and forming regulatory complexes. RNA-protein interactions are vital in controlling core cellular processes like transcription and translation. Therefore, identifying proteins that interact with lncRNAs is the first step to deciphering lncRNA functions. Here, we describe an RNA-protein pull-down assay, which enables the identification of proteins that interact with an RNA under study. As an example, we describe pull-down of proteins interacting with lncRNA ELENA1, which promotes the enrichment of MED19a on PR1 promoter to activate PR1 expression. This work was supported by Singapore NRF RSSS Grant (NRF-RSSS-002).